Happy Kids by Cathy Glass is a fresh and exciting self-help guide to successfully managing children’s behaviour, from babies to young adults. Cathy’s technique, called ‘The 3Rs’ is her own, and is based on sound child-management strategies. The book has been spawned by the huge success of her fostering memoirs – Damaged, Hidden, and Cut, where Cathy is shown, not only forging relationships with the children she looks after, but also successfully managing and vastly improving the children’s often very difficult behaviour. Happy Kids has wide commercial appeal with a huge target audience of parents, carers, teachers, nursery nurses, nannies, childminders; in fact anyone who looks after children and is responsible for the children’s behaviour. To compliment this book Cathy runs a Forum on her website – www.cathyglass.co.uk where readers can email their questions on managing children’s behaviour and receive a personal response from Cathy. "... a discipline technique that can tame out-of-control children in under a week. Cathy Glass, a mum of three, is promoting a non-violent three-step approach known as the "Three Rs" - request, repeat and reassure. She has revealed the technique for the first time in a new handbook, Happy Kids. " " ... help transform your little monsters into little angels. Parenting expert Cathy Glass reveals simple but effective techniques that are a must-have for parents and grandparents! " " I loved her no-nonsense, down to earth approach, I could hear her voice from her fostering books. I would certainly recommend this book even if your children are teenagers and young adults. What she says makes so much sense. " " Drawing on personal experience, Glass covers a host of problems, including sibling rivalry, special needs and changing behaviour. " 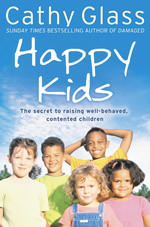 " Happy Kids is a compendium of common sense advice on how to bring up children to be well-behaved and happy using Cathy Glass 3 Rs technique. The author has written in a clear style with wit and humour. " " I now apply the 3R's to my own children and children I care for and can honestly verify that Cathy's 3R technique does work whatever the child's age or behaviour problem. I am sure it will work for you too! "